In the 50s and 60s the average man bought a new suit every couple of years, and in 1965 the menswear industry sold thirteen million suits. Most of these were bought at one of a number menswear chains which were common on Britain's high streets in the 50s, 60s and 70s. The most well known and most prolific was Montague Burton, which still exists today as Burton. However, changes in tastes mean that formal suits make up only a small proportion of the what the chain sells today. Very few of these shops still survive today. Burton was by far the largest chain. In 1965 there were 511 Burton Tailoring shops in Britain. Sir Montague Burton founded the empire in 1900 with one shop in Chesterfield and the ambition to bring made to measure tailoring to the man in the street. He succeeded and the business prospered. The second largest chain was John Collier. There were 331 John Collier stores in 1965. John Collier had a similar history to Montague Burton. It was founded by Sir Henry Price in 1907 also trading from just one store at Silsden in Yorkshire. He traded under the name of Fifty Shilling Tailors. In 1953 the giant United Draper Stores Limited acquired Fifty Shilling Tailors and changed the name to John Collier. Collier was sold to Hanson in 1983 and finally to the Burton Group in 1985, which then closed its rival. Buying a suit from one of these shops was not quite what you might imagine. There was no tailor actually working in the shop. You came in to the shop to be measured by an assistant. The process took about half an hour, after which the sales assistant sent the measurements to the factory which manufactured the suit. You then went back to the shop for a fitting a week or two later. You tried on the suit and agreed alterations with the sales assistant. There could be two or three fittings and the whole process could take six weeks. The factory was an important part of the model and the economies of scale allowed Burton, Collier and Hepworth to offer good quality suits at very reasonable prices. In 1967 Burton employed 20000 people in its tailoring factories and shops. 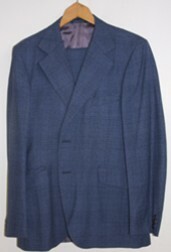 A suit from Burton's cost £17 10s (or £17.50) in 1966, about £225 in today's money. You would struggle to find a made to measure suit for that price today. If you went to a more upmarket shop in the 1960s, such as Austin Reed or Simpson, you would receive a traditional service, with several fittings. You would pay considerably more for this, around £50, or £640 in today's money. The end product, according to Which? magazine, was only slightly better. Suits from Savile Row tailors were cut more generously and offered a slightly better fit than those made by the high street tailors. But Burton was only slightly behind in terms of the quality of material and wear. 2. The Monopolies Commission - United Drapery Stores Ltd and Montague Burton Ltd - report on the proposed merger (September 1967). "Dear Steven Braggs: Can you provide any photos of George Doland shops? I believe his main shop fitting contractors were Courtney Pope, but there appears to be no archive of their work. I will be very grateful for any help or leads to information. "Dear Steven, An excellent article on the the menswear industry during the 50s, 60s & 70s. It brought back memories of several made to measure suits - 2 & 3 piece I bought from the Burton store opposite Turnpike Lane underground station North London. 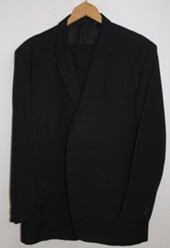 Interestingly I have just inherited a three quarter length John Collier overcoat - it belonged to my wife's late grandfather and as far as we know it has never been worn. Fairly thick, heavy wool material and dark charcoal in colour. Will be well used during future winters. Once again, congratulations on an excellent article. "Thank you for this article - my other half has just purchased a vintage 'Weaver to Wearer' jacket and it's great to be able to place an approximate age on the piece! 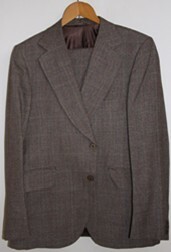 I have a complete 3 piece linen mix suit by Design Circle / John Collier, cheeky question but any idea if it's worth anything? Would you have any history on"Meakers" of Piccadilly, my grandfather worked there in hosiery and died in the blitz outside Meakers as a watchman in April 1941, very little is known about Meakers other then he worked 15 years there. I worked at willerby in the 70's. The name john Barron seems familiar. "Hi I worked started work for John Collier in 1984 and after approx 6 months they were re branded to a Sub brand called Smart Alex. Don't think there were too many of those. After they were bought by Burton it was turned into a clearance store and we used to get end of lines from Burton & Topman. "I have been searching for a Dunns Tailoring Shop now for a number of years and have finally found the sad news that they are no longer in business. When I lived in Newcastle upon Tyne, I bought all my suits / jackets and trousers at Dunns exclusively and they gave me superb service, even remembering my style, colour preferences and inside leg measurements. I moved from Newcastle to Cumbria and was delighted to find the English St. store in Carlisle and on entering, even more delighted when a voice rang out " Hello Mr. Morton !" It was my favourite assistant who had been promoted to the Carlisle store as manager. He still remembered my preferences and would 'lay by' anything he thought I would like -- and he was never wrong. How I miss that wonderful tailoring. I never had a misfitting garment from Dunns. Sadly I have never had a good fitting pair of trousers since they closed, apart from a very expensive McGee suit bought from the also now non existent " Campbell Brown's "
"I have retained a tie from my school boy days, which shows a beautiful lady on the front of the tie and a reverse on the tale of the tie.It is a Neville Reed Manshop Sheffield tie. I obtained it new in around 1953 as a 14 year old, cost me 10/- shillings. "I spent the early part of my working life with various multiple tailors. The practice, at the time, was to dance from one company to another, for an extra pound or two a week. Full employment in the sixties. I worked for John Temple, John Collier and Hepworths. I'll never forget that when a customer requested an interim fitting we made a discrete note on the measurement form 'mock baste'. When the completed suit arrived at the store we covered it with white, long stitched cotton and tailors chalk. The customer came in for his fitting. We made several more chalk marks on the coat (not jacket) and asked him to return in a couple of weeks to collect the finished garment. The threads were removed the tailors chalk brushed and pressed out. Finished item! I also recall that when a customer complained that the coat was uncomfortable under the arm he was asked to return the following week, following alteration. The alteration? A knee in the arm hole and a good yank until you heard the stitching begin to give. Sorry but I can't remember the Managers Name at Putney, but he had an assistant who I believe was called Mr Duggon? The managers name at Chiswich was Eddie ?? (think it began with an S? And I remember a Wimdow Dresser at Chiswick named Sid Collis (or Collins?) Big Fella. Larger than life. I can also see the window dresser in the Ladies Shop over the road. Famous for her very short mini-skirts! Eddie used to bet on the horses and I was forever running over to the bookies for him. Good times! For the record, I left the trade and went into Engineering and Production Management. "Great article... certainly brought back so many memories walking down the High Street and passing all the branches of men's wear stores in the 40s / 50s and 60s. I wonder if anyone remembers either of my uncles? The norm then was22 ""
The tailoring business in question was owned by Sir Henry Price: You might find this interesting. Sir Arthur Price was the man who owned FSTs. This will tell you the full story. "I worked for Willerby Tailoring when I left school in 1971 at the shop in Leytonstone &, occasionally at the shops in Tottenham, Walthamstow & East Ham. I remember, being the junior (well, there was only me & the Manager) being sent to Basildon to pick up a suit from the factory, a journey that involved underground, mainline & busses as I didn't drive at the time. "Hi all very interesting, worked for Hepworths from 1976 (17 year old) till 1983. Started off in their Hyde (ches) branch moved to stockport as AM then to congleton as manager, I then moved back to Stockport when they opened a concession store in Debenhams (they had about 35 of these). The training at Hepworths was first rate,Sadly by 83 they were closing branches left right and centre after the took over Kendal rainwear and George Davies moved into convert the company to Next (which he almost bankrupted in its early years.) I moved into the greeting card publishing business where I stayed until poor health forced my early retirement. But I still look back at my days with "Heppys" as the happiest of my working life. "I worked in Burtons Oxford store on Cornmarket St around 1975 before joining the Royal Navy. I remember Mr Woods the manager a lovely kind chap - very proper and by his mannervprobably ex army but a great person to work for who had time for everyone . Other people I remember Paul and Graham .We could all earn good commission on suits ,shirts and extras and of course had good staff discounts. DON'T FORGET YOUR STINT AT ABERDEEN ... ?? HOW CAN WE ALL MEET UP, WOULD LOVE TO SEE BOTH YOU AND MICK !! Still in the force ? "I have recently bought a beautiful painting of John Temple's Outfitters and I'm finding it very difficult to locate where it was in Glasgow? If anyone from Glasgow knows where John Temple was, it has a number 9 tram on the same road, please get back to me on elliecasson2@hotmail.com with the subject "John Temple"
I need to know where this painting was made! As a lad who left school at 15 in 1958 I went for an interview as a junior at Lavey's Bromley. I was interviewed by your lovely dad and got the job. "I was lucky enough to find a beautiful tweed overcoat today, in the vintage clothing market at Gloucester Green in Oxford. It has the brand label 'Dhobi' in it. The quality is outstanding, it's fully lined and the pockets are much better constructed than would probably be the case on a new overcoat. It was the princely sum of £10.00! Could this have been made by Meakers of Piccadilly? If anyone has any information about the Dhobi brand, I would be most grateful to hear from you. Perhaps Ican throw a little light on your 'Dhobi'. The Company 'Weatherlux' Ltd, Clegg Street Oldham, (now long gone like most UK made Clothing)made your coat. The 'Dhobi' as I remember the brand in the Mid 60s was a very successfully marketed reversible raincoat/Topcoat sold into better end retailers. You mention the nice finish and the fact that it is fully lined...could it be that your garment is reversible?